The 25DL PLUS ultrasonic thickness gauge. 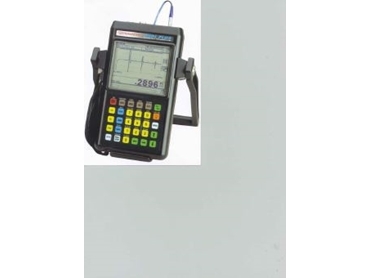 THE 25DL PLUS is an advanced ultrasonic precision thickness gauge that displays both the thickness reading and the ultrasonic waveform (or A-Scan) on its large LCD screen. It has many practical measurement features and a sophisticated alphanumeric, file-based datalogger. This handheld thickness gauge can be used with various transducer types to make very accurate, one-sided measurements on almost all materials. The A-Scan is very useful in applications where the user needs to verify the echo trace or ensure proper transducer alignment. Typical applications include turbine blade inspections, multi-layered plastics, thin materials and coatings. The 25DL PLUS with its colour-coded, direct-access keypad is easy-to-use. Its measurements are non-destructive, which means that the probe needs to be placed on just one side of the part in order to make instant, accurate thickness measurements. In addition, the unit has 25 default transducer setups for direct contact, delay line and immersion transducer. The gauge also offers 35 customs transducer storage location making it easy for the user to store and recall special transducer setups for almost any thickness gauging application. · Uses contact, delay line and immersion transducers. · Built in A-Scan display for waveform verification (RF, half + half-, or full wave rectification). · Selectable waveform update rate (4,8,12 or 20 Hz). · Internal alphanumeric file-based datalogger stores 18,000 thickness or 1,750 waveforms. · Application auto-recall with stored standard and custom setups.